Getting through the day can be a struggle. You hit 3:00 p.m. and you feel like all you want is to fall into bed and sleep until the next morning. Maybe you throw back a coffee or 5 hour energy shot? Maybe you’re like me and push through until you hit another wind of energy? Whatever your coping mechanism, Dr Oz is providing his solutions. Audience member Angeline is a busy mom. She’s trying to keep it all together, but then she lets herself fall by the wayside. Her exhaustion seems to drain more and more until Mondays are like dragging herself through the day. Dr Oz suggested 200 mg of Astragalus Root twice a day. It slows down the aging of your cells and you may not see the results, but your body will feel it. The supplement actually lengthens the DNA strands in our bodies, and you can eventually look and feel younger. Another of Dr Oz’s recharging mechanisms is Brewer’s Yeast. It has chromium with regulates blood glucose levels. Adding a couple of tablespoons of this powder to meals everyday or sprinkling on popcorn are just a few ways to add it in. 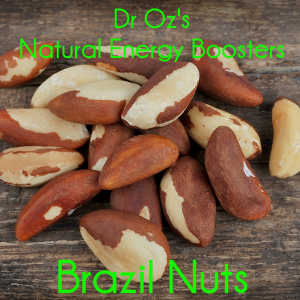 Dr Oz looked into the natural ways to boost your energy by using Astragalus Root and Brazil nuts. Plus, what’s going on your vitamin deficiency? Next tip, drinking papaya juice. Delicious and simple, no? It contains the Papain Enzyme, which gives you a higher boost than the fruit along. If you notice that your energy levels are falling as you age, this enzyme will help you take more energy from the foods you eat and digest. Need an energy boosting snack? Dr Oz likes to recommend Brazil Nuts. These are high in magnesium, which can be converted into energy. Eating one or two a day makes a big difference. They even have a longer shelf life, so you can store them anywhere. Magnesium is also really important for hearing! Dr Oz suggests taking 400 mg a day to protect the tiny hairs in your ears. If you are having trouble tasting things, you may have a zinc deficiency. You can take a 30 mg zinc lozenge once a day to boost your taste buds, energy levels and sense of smell. Another deficiency on Dr Oz’s radar is Vitamin D. The easy way to test for Vitamin D deficiency is by pressing your thumb in the center of your chest, on your sternum. If you feel discomfort or pain you may be Vitamin D deficient. We get Vitamin D from the sun. It strengthens our bones and fuels our immune system. Dr Oz said a supplement can clear this up. Should you find yourself alone, or with some curious friends, try this at home Vitamin B12 deficiency test. Close your eyes and stand up straight. With you eyes closed, lift your right foot into the air and hold it there for three seconds. If this is hard, then your neurological system might be off due to low Vitamin B12.